Described as NY’s real “Little Italy” Arthur Avenue is a must see for anyone who wants a true Italian shopping experience. We decided to take a quick detour, on our most recent trip to NYC, and head to Arthur Ave. Walking through this charming neighborhood we were instantly transported back in time to what it must have been like when the Italian Immigrants first settled here. pastries and fresh crusty loaves of Italian bread. The highlight though is the large indoor market that was established in 1940. Here you can find everything from a butcher selling fresh goat; to authentic Italian kitchenware; to a group of Italian men playing cards in the corner. There are produce stands, bakeries and meat and cheese shops also throughout the market. 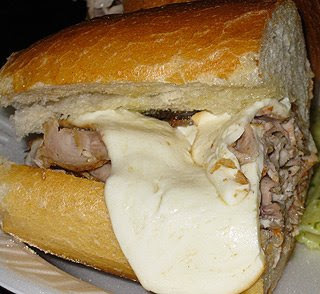 On our adventure we stopped at the famous Mike's Deli and enjoyed a delicious roast pork and smoked mozzarella sandwich. If you ever find yourself in or around the Bronx I would highly recommend checking out Arthur Ave it’s truly an Italian culinary treat. I've only been there once years and years ago. It's time to revisit after reading your post. Wow that certainly does look like real Little Italy. Those baguettes look unbelievable. I have to get back to NYC and spend time just wandering around. Last time was for business and it was just that. What a delicious market! The sandwich looks amazing! Holy Cow that pork sandwich looks awesome! THIS IS HOME!!!! Mom grew up around the corner and I spent at least part of most Saturdays here as a kid... we did all of our shopping for the holiday meals and a lot of our regular Sunday dinners right here... From the pics above, looks like Randazzo's for fish, Addeo's for bread- I can still smell that smell, the baking, the sesame seeds, those small black and white tiles on the floor that were laid down before they came in sheets... all by hand...and at Mike's deli... is Mike still behind the counter? His son has taken up the business and does a great job although Mike is stil there every time I have been back... he used to make fried green tomatoes... mmmmmmm... to die for... When I worked downtown (Manhattan) we used to put together a huge order a couple of days ahead and they would deliver for us... as a kid, we went to Danny's for sausage (no longer there), De Lillo's for pastry or a rhum cake for birthdays and the best Lemon and Chocolate ices in the summer time, D'Aurichio's for dried sausage, Addeo's for bread (Rocky was always laying out front hoping for a friendly pat on the head), Mike's for cheese and cold cuts and olives, Borgatti's for ravioli or fresh sheets of pasta to make manicotti, fruits and vegetables from the guy in front of Mike's Deli, who I would swear was a pirate when I was a kid- who wouldn't, I mean a bald head and earrings??... and of course, stop into the Half Moon for a slice and a Manhattan Special (although now it is the Full Moon and moved two doors west to the corner)... and everywhere we went, they all knew Gramma... it was a different time, when service meant more and a regular customer was valued... I can't tell you the number of times I have been to Mike's and looked at the long line-people coming from as far as Connecticut- and the Boss would always pull me aside, asking if anyone took care of me yet... "How's your uncle? How's your Grandmother?... let me take care of you myself- give me just a second to finish this up"... I miss that world and stop in for a meal every time I go back to NY for a visit. I am so glad you enjoyed it- makes me miss it even more. omg look at that bread! I could seriously eat all of that right now!! That market sounds fabulous! Food Hunter, what a terrific blog! Your photos and text about New York make me think of the visit my wife and I had with friends (far too long ago) in the city. It was terrific, and you make me want to go back! Great work, please keep it up! My dad grew up on Arthur Avenue and my grandparents lived there up until a few years ago. My dad still won't buy raviolis from anywhere but Borgatti's! And that street houses some of the best bread/pastries/Italian restaurants that NY has to offer.